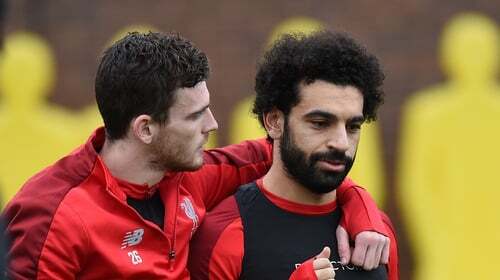 Liverpool's Andy Robertson believes opponents are clutching at straws attempting to brand Mohamed Salah as a diver. Egypt hitman Salah converted the penalty he won for himself to steal Liverpool a 1-0 win at Brighton on Saturday, reaffirming the Reds' Premier League lead. Asked if any of the rough treatment dished out to Salah bothered Liverpool, Scotland full-back Robertson replied: "None of it apart from the diving, he's not that type of player. "Every time it happens then we go back and everyone looks at the video and you go, 'well, it's not a dive' so how many times is it going to happen? "I'm not sure if the Brighton players did say it was a dive or not and I'll need to see it back but I was at the edge of the box and for me it was a stone-waller. "If people are starting to say Mo has gone down easily it's not fair because the one against Arsenal, especially, he got clipped three times on his way down and they still appealed it so it's a bit of desperation. "I've not seen this Brighton one back but it's a no-brainer really for the referee." Salah celebrates after scoring a penalty against Brighton. Liverpool's 2-1 loss at City proved their first of a stunning Premier League campaign, and prompted an FA Cup loss at Wolves. "We hope we are here to stay; that's the main objective, keep winning the games and keep on top because that's where we are right now," said Robertson. "But if things do start going wrong we need to get back on track quickly. I wouldn't say it went wrong at the Etihad but it was our first defeat and it was good to follow that up with a win. "The two Brighton games have been massive for us because we have not been at our best. "When we played them at home we weren't at our best and they probably had a few more chances and we won 1-0. "And then on Saturday we did the exact same. "It's that winning mentality. Whoever wins the league will look back on some games and go 'do you know what, we probably weren't at our best there, and that was probably one that helped us turn one point into three or zero into one'. "So there will be games over the season and whoever does that will probably have three or four games to look back on and if we manage to do it, I'm sure we'll look back on this game as one of them." "We've had a wee girl, all healthy, we've called her Aria but I'll give my wife all credit for that," he added. "It's a great thing welcoming another child into our lives and it's a big thing for us."